An interesting about Sichuan peppercorns (花椒) is that they are not really a pepper at all and many people are surprised to learn this fact. 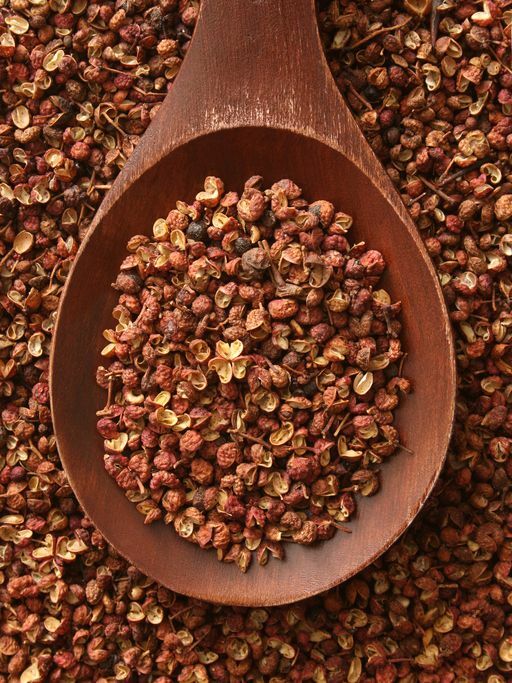 Sichuan peppercorns consist of the pinkish-red dried outer husks of the prickly ash shrub. Sichuan peppercorns have an aromatic fragrance that has been likened to lavender. However, it’s main claim to fame is the powerful numbing sensation it causes around the mouth. When married with chili peppers (the other key ingredient in Sichuan cuisine) chefs believe this numbing effect reduces the chili pepper’s heat, leaving diners free to appreciate the capsicum’s intense, fruity flavour. Sichuan peppercorns have given Sichuan cuisine a distinct identity in Chinese cuisine. Many people think of Sichuan cuisine as “hot and spicy” but a more accurate way to describe Sichuan cuisine would be “numbing” (麻). My grandfather used to tell me Sichuan people trained their children to eat hot and numbing food by putting ground Sichuan peppercorns in their milk but I think my grandfather was just trying to trick me into eating all the spicy and numbing delicious dinners he made. Even though my grandfather, who basically raised me, was from Sichuan I only travelled to Sichuan a couple times when I was younger to visit my family. They put Sichuan peppercorns and other spices on pretty much every dish. They even added it to the to the savoury flavour “Douhua” (like a super soft tofu). One of my favourite foods from Sichuan is Sichuan Spicy Hot Pot (麻辣火鍋), you can see Sichuan peppercorns, chili and other spices floating on a layer of hot chili oil and broth. It feels like you’re drinking boiling lava when you eat it but it’s so delicious. I took my husband to Chengdu, the capital of Sichuan, in 2007 to see the Giant Panda Sanctuary and to also meet some of my (very) extended family. We went to the same hot pot restaurant Anthony Bourdain visited (he visited at a later date) and for every mouthful of food Chris ate he had to down a cold bottle of beer. But and most importantly he said it was absolutely delicious. Once you have tried food cooked with real Sichuan peppercorns from Sichuan, you will feel any Sichuan peppercorns you buy from the UK or US supermarket are tasteless. peppercorns to be ground and roasted. Ground, roasted Sichuan peppercorn are used to make an infused oil and are also paired with salt to make a flavourful seasoning. Sichuan peppercorns are one of the five ingredients that make up five-spice powder (the others are star anise, fennel clove and cinammon). How to store Sichuan peppercorn or ground Sichuan peppercorn? Be sure to store Sichuan peppercorn, ground Sichuan peppercorn or Sichuan pepper oil in a clean, dry, sealed jar away from light. Also Known As: Szechuan (Sichuan) pepper, flower pepper, flower peppercorn, hot pepper, prickly ash, hua jiao. This recipe gets its name from the shoulder poles (“dan dan”) that noodle sellers used to carry all their goods, including their stoves, noodles and the secret sauce. There are many different ways of preparing Dan Dan Noodles: this recipe has a spicy meat sauce made with Sichuan preserved vegetable and ground pork, and leaves out the sesame paste found in many versions. Getting tired of using plain old salt to season your food? Sichuan peppercorn salt makes a spicy alternative. Feel free to improve upon the basic recipe by adding other types of peppercorns, such as black or pink peppercorns, to the mix. The flavor in this popular seasoning comes from aromatic Sichuan pepper. Use it to add some zing to stir-fry dishes, dipping sauces or wherever your imagination takes you! To add even more flavor to this Sichuan dish, feel free to garnish with toasted sesame seeds before serving. Mapo tofu is one of the signature dishes of Sichuan cuisine. This is a must try dish of Sichuan cuisine! In this Sichuan recipe the beef is dry-fried, making it chewy and crisp. If you like, you can replace one of the carrots with ½ cup of celery that has been strung and cut julienne-style. Feel free to make the dish hotter by adding more chili paste or sauce if desired. What Does Amandine Mean in Cooking? What is Kasha and How is it Cooked?